One of those realties in workplace is that you will always encounter all kinds of people – those you like and others you don’t. But because you have to excel in your work, you should not dream of getting ride of them but learn how to cope with them. There are many characters you need to cope with. 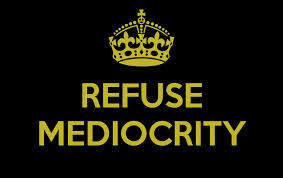 Today, I want to talk about mediocre. One of the people you will certainly encounter at work are people who don’t know their work or are outdated I either skills or knowledge. These characters can make your work bad; so bad that it seems as you don’t even know your work. I give you an instance. You are supposed to produce a commercial (like radio advert) and your job is to write a script and package the sound. But an artiste should be there to voice the script. If the voice over artiste fails to do his own beat well, your production will be a flop. Believe me, even outside media cycle, there are people who either don’t know their job or are not in tune with current realities of their job and they will either not do the job at all or do it poorly. What do you do to the person when you don’t have authority to punish the person or sanctions him? Report to higher authority? Then you will be an enemy for life. Compel him to do his job; then he will warn you not to teach him his job. So, what do you do? Do everything within your power to get him to do his work without any grudges. Now, here are some things you can do. Be a friendly as possible to him and encourage him to do his job. Don’t sound authoritative. Don’t even sound as if your know better than him. You can say something like this: “What about attending to those files on your table.” You can also say, “This work no easy o; but since we have accepted to do it; let’s try our best to do it the best way possible.” He will see you as a friend and a team member and work with you to achieve the result. Believe me. My guys, let me share with you my experience working with ladies. Don’t treat them strictly as the boss, even if you are. If you do so, they may even go as far as comparing you with their husband or boyfriend who is more handsome or richer than you. Treat her as a lady that she is. Be nice to her, the way you treat your woman or potential woman and she would want to come to work because of you. She would want to do the work even when it’s not convenient. Another way that mediocres may affect you is to keep you at their levels. They may not come out to tell you that openly but will by their interaction an attitude to work. Be careful to ensure they don’t get your mind corrupted. Don’t give heed to comments like, “It’s their job.” “Let’s manage it.” These are mediocre slogans. Don’t manage any work when you can get the best. In summary, how do you cope with mediocre? Don’t allow them transfer their mediocrity attitude to you. Encourage them to do their work so that yours come out fine. And set a goal of continuous improvement.